Executive Director John Kamm delivers remarks at the annual friends of Dui Hua holiday celebration, December 5. On the evening of December 5, 2017, more than 60 friends of Dui Hua gathered for the foundation’s traditional holiday celebration at the Presidio Golf & Concordia Club in San Francisco. Dui Hua Executive Director John Kamm briefed guests on the foundation’s activities in 2017 and plans for 2018. Judge (ret) Leonard Edwards gave a special presentation on the US-China Juvenile Trial System Reform Seminar that was co-hosted with the Supreme People’s Court of China in November in Shenzhen. Five of the seven experts who traveled to Shenzhen attended the event, and contributed observations and conclusions. Kamm began his remarks by going over the results of the 19th Party Congress held in Beijing in October and President Trump’s state visit to Beijing in November. Both events have implications for human rights in China. While cementing his position as the “core” of the Communist Party’s leadership by having his name inserted in the party constitution, Xi Jinping has moved to rein in party abuses like shuangguei. Noting that there had been positive developments like reducing the number of juveniles in prison, cutting the number of executions, and enhancing transparency, Kamm decried the rise in the number of arrests and convictions for non-violent political and religious activities. Kamm opined that the focus by President Trump on securing the release of three UCLA basketball players who had been detained for shoplifting detracted from the effort to have a broader dialogue on human rights that dealt with the cases of both American citizens and Chinese activists. There was no public mention of human rights during the state visit. Judge Edwards reviewed the results of the seminar on juvenile trial system reform which was attended by more than 40 senior judicial officials and judges from 15 provinces in China. Both sides learned a great deal about efforts to reform the juvenile trial systems in the two countries. The American team was impressed by the quality of the presentations and the dialogue, both during the sessions and in less formal settings. The visits to sites rarely visited by foreigners – including two courts and two facilities for rehabilitating juveniles on probation – were highlights of the two-day program. Judge Edwards’ remarks were followed by comments from Dui Hua Director Magdalen Yum, who played a key role in organizing and underwriting the Shenzhen program. Looking ahead, Executive Director Kamm revealed that Dui Hua has begun work to hold an international symposium on “Girls in Conflict with the Law.” The foundation has identified an enthusiastic partner in Hong Kong, and experts are being identified. The program is tentatively scheduled for 2019. Talks to push the idea forward will take place during Kamm’s visit to Beijing and Hong Kong in January 2018. Kamm reminded the audience, most of whom live in the Bay Area, of something that Napoleon Bonaparte famously said: “An army marches on its stomach.” In Kamm’s words, “An NGO marches on its bank accounts.” He thanked Dui Hua’s supporters for their assistance. Although the December 5 event was not a fundraiser, it nevertheless resulted in a number of generous donations. Dui Hua will end 2017 in a strong financial position, ready for another year of hard work promoting human rights and judicial reform in China and the United States. Dui Hua has information on three individuals who remain in jail for counterrevolution. Twenty years ago, the crime of counterrevolution was removed from the Criminal Law. The two other remaining known counterrevolutionary prisoners are Uyghurs. Some Uyghur political activists have received sentence extensions after entering prison. In 2015, the Chinese government informed Dui Hua that Abdukerim Abduweli, chairman of the Islamic Reform Party, had received five sentence extensions for violating prison rules. The Urumqi Intermediate People’s Court sentenced him to 12 years in prison on May 6, 1993, for counterrevolutionary propaganda and incitement and leading a counterrevolutionary group. To date, he has been imprisoned for 27 years and still has one more year to serve before his sentence expires in December 2018. Omer Akchi has served his sentence for the now defunct crime of counterrevolution for 21 years. Detained in December 1996 for organizing the Islamic Party of Allah, Omer Akchi was sentenced to 14 years’ imprisonment in Xinjiang’s Aksu Prefecture. In 2006, he was sentenced to life imprisonment for splittism while serving his sentence. He is not known to have received any sentence reductions. In November, President Trump made his first state visit to China. While in Beijing, Trump decided to personally intervene in the case of the three UCLA basketball players who were arrested for shoplifting. The story detracted from the valuable opportunity to raise cases of other American citizens and Chinese political dissidents currently being held in China. Dui Hua was cited in articles in The Washington Post and Newsweek covering this story. Wu Aiying, former Minister of Justice. Image credit: Caixin. I returned to Beijing on June 28, 2005. Shortly before arriving, I phoned a junior official at the MOJ and was told that everyone was too busy to see me. This would be the first time since 2000 that I would not be afforded a meeting with officials of the MOJ on a trip to Beijing. A woman by the name of Wu Aiying was settling into her new job as Minister of Justice. I later learned that one of her first acts was to order the cessation of all cooperation with Dui Hua. My next trip to Beijing was in October 2005. Upon arrival, I phoned the Director General of the Department of Judicial Assistance and Foreign Affairs Mr. Gong Xiaobing. I had a good relationship with Mr. Gong, having hosted him in San Francisco. Mr. Gong told me that, as an old friend of the ministry, I could visit the headquarters at the precise date and time he specified. He said I should arrive promptly, not a minute early or a minute late. To get this meeting, I would have to agree to three conditions: 1) There would be no talk of cooperation between Dui Hua and the ministry; 2) There would be no talk about “criminals;” and 3) I would not try to hand over a list. I was shocked. “What else is there to talk about? What’s the point of having a meeting?” I asked. I protested that this was a serious violation of the understanding under which we had operated for nearly 15 years, and that I would make a “solemn representation” to the Ministry of Foreign Affairs (MFA) when I met them the next day. Mr. Gong sheepishly replied: “Please understand. I didn’t make this decision. It was made at a senior level.” He was referring to Wu Aiying. Wu Aiying was born in Shandong Province in 1951, the daughter of poor peasants. She joined the Communist Party at a young age, and was admitted to Shandong University in 1971, during the Cultural Revolution. She was almost certainly a Red Guard. She had studied the thoughts of Chairman Mao for two years, which was the extent of her undergraduate education (After she became MOJ minister, she received a law degree from the Party School.) She rose through the ranks of Shandong officials, becoming a senior member of the Communist Youth League in 1982. 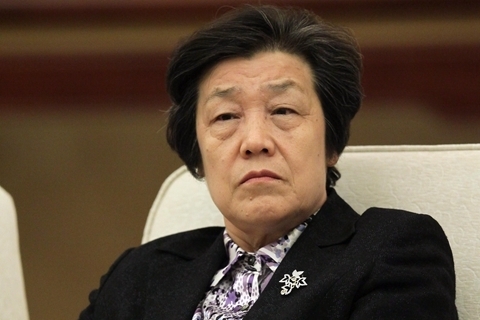 She became a vice governor of Shandong Province in 1993 in which capacity she oversaw the police and the courts. Some of the harshest sentences of counterrevolution were handed out in Shandong Province. Wu became a vice minister of justice in 2003 and was appointed minister in July 2005. She was a prominent member of the China Youth League faction, a bastion of support for then-Party Secretary Hu Jintao. Wu Aiying was known as an ignorant, short tempered official who had famously upbraided an official whose cell phone had gone off during one of her meetings. She knew nothing about law, preferring to talk about cooking when meeting foreign visitors. She enjoyed traveling abroad where she was given expensive gifts and enjoyed lavish banquets. The MOJ under Wu Aiying did everything it could to undermine Dui Hua’s work in China. In addition to refusing to see me, accept lists, or give answers to my queries, the ministry barred me from visiting prisons. On a visit to Yichang in central China, a visit to a prison that had been agreed to in advance by local officials was abruptly cancelled on orders from Beijing. In February 2014, Dui Hua partnered with Renmin University School of Law to hold an international symposium on women in prison. Despite Dui Hua having invited the MOJ to participate in the conference more than six months in advance, and despite the relevance of the topic to the MOJ’s work, the ministry said they were too busy to attend. Ministry officials actively discouraged Chinese Mainland participants from attending, resulting in the cancellation of a presentation from a senior member of the China Prison Society. The dismantling of the MOJ’s relationship with Dui Hua was but one act in a wide-ranging assault by Wu Aiying on human rights dialogues with foreign governments and international organizations. She resisted providing responses to lists accepted from the MFA’s official dialogue partners. In 2005, China had official dialogues with nine foreign governments. In 2016, her final year as minister of justice, the number of dialogues had shrunk to three. She told the president of an international humanitarian organization that visits to Chinese prisons were out of the question. The damage Wu Aiying did to bilateral human rights dialogues paled in significance to the damage she did to Chinese activists and human rights defenders. She tightened rules governing clemency, reducing the number of sentence reductions and paroles of political prisoners. The MOJ oversees and licenses China’s lawyers. Wu Aiying made sure that human rights lawyers were stripped of their licenses. She doubtless played a role in the crackdown against those lawyers that began in July 2015. She opposed granting medical parole to prominent political prisoners including Chen Guangcheng, Tenzin Delek Rinpoche, and Liu Xiaobo. The latter prisoner, who was awarded the Nobel Peace Prize in 2010, served virtually his entire prison sentence while Wu was minister. He passed away in July 2017. It turns out that Wu Aiying was not only an ignorant and crude obstructionist, she was also a poor judge of people and a terrible manager. In early 2017 it emerged that the director general of the MOJ’s political department, Lu Enguang, was a conman and scam artist who had faked his entire biography – education, age, even party membership – to gain a position in the MOJ. Lu Enguang, like Wu Aiying, was a native of Shandong Province. He was promoted by Wu Aiying, to whom he gave expensive gifts and for whom he performed menial tasks. According to Chinese media reports, as many as 20 other senior MOJ officials benefited from this conman’s corrupt activities. Lu was arrested and is awaiting trial at the time of this writing. Wu Aiying was removed as Minister of Justice in July 2017. She was expelled from the Communist Party at the 19th Party Congress in October 2017. Lawyers all over China rejoiced at hearing the news. It is expected she will face trial, and she could well wind up in one of the women’s prisons she once oversaw (during her tenure at the MOJ, the number of women in prison in China rose by more than 50 percent). If she goes to prison, she will have received her just deserts.